"Have rubber boots, will travel and brew." Brewmaster Teri Fahrendorf shared her adventures while she camped her way across the nation in Big Buddy, her 15-foot trailer. As the west coast's unofficial craft beer "Goodwill Ambassador," Teri visited and brewed with professional brewers all across the USA. August 31: One of the most fun things about working at a small brewery all day is that I get to see and experience a wider variety of tasks. Today I spent the day with the kind folks at Cape Cod Beer Company. (They have really been taking care of me!) 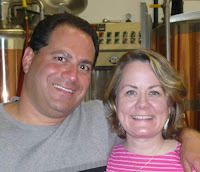 Todd and Beth Marcus began their microbrewery in 2004 when the brewpub where Todd brewed stopped brewing beer. The beautiful copper-clad brewery just sat there. Then Todd made a deal to lease the brewery from the restaurant and begin self distributing his beer under the name Cape Cod Beer. When the restaurant went under, Todd bought the brewing equipment and moved it to a commercial location. Cape Cod Beer will produce 2,400 barrels this year, seven barrels at a time. Photo at right is me mashing in two bags of pre-milled malt for the first of two batches of Cape Cod Red that Brewer Brian Flagg made today. This is one of the hardest working breweries I have visited on my trip so far. Owner/Brewmaster Todd Marcus and Brewer Brian Flagg regularly put in 16-hour days. 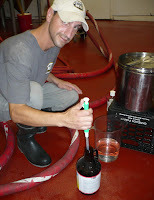 Photo at left is Brian acid-washing the yeast for the second batch. 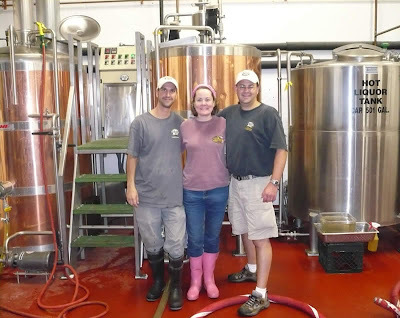 Cape Cod Beer acid-washes their yeast every time they repitch. Not only did Brian brew two batches of Cape Cod Red today, he also filtered a double batch of Cape Cod IPA through the plate and frame filter. I had to catch up on blogging, so I spent a good portion of the middle of the day in Sales Guy Blake Decker's office on my laptop. Blake not only takes orders and delivers the kegs, he also fills his own kegs from the Bright Tanks. The whole family gets involved in this Mom & Pop brewery, including Beth's pop, Jim Melvin. (Beth's mom Barbara volunteers family duty babysitting the two boys.) Photo at right is of Jim restocking the growler cooler. Jim was busy on his feet all day, washing and filling growlers, and waiting on customers. Today was the Friday before Labor Day Weekend, and the crowd was non-stop in the gift shop, buying t-shirts, hats, but mostly getting their growlers refilled and buying more and more growlers. All of Cape Cod's beer is sold as draft, whether kegs to retail accounts, or growlers to beer fans who come from all over the Eastern Seaboard to buy Cape Cod Beer's "A Vacation in Every Pint" beer. Todd and Beth gifted me a really nice 16-oz coffee mug with their logo on it. After the end of the day, an old brewing friend of mine, Jim Migliorni, picked me up to bring me to his house for dinner. Jim (photo below) is now a middle-school teacher on Cape Cod, but he used to be the Brewmaster for Heartland Brewing Company in New York City. Jim made a splendid dinner of local Quahog Clams (pronounced co-hog), devilled with some chorizo sausage and green and red peppers. After that appetizer we had spiced chicken over spaghetti. Jim and I had fun catching up. He pretty much disappeared from the brewing radar when he quit Heartland and moved to Cape Cod. If any old buddies want to get hold of Jim, just email me and I'll forward you his email address. All this socializing keeps me up late at night, but my husband is three hours behind me on Pacific Standard Time, so I still get to talk to him each night. Now that he is between jobs for a week, he is busy condensing and packing all of our things for our future move to Portland, Oregon. We used to be spread out over two sides of a duplex. Now we are condensed into less than one side of the duplex. He tells me I won't even recognize our place it is so jam-packed. Yikes! It will be an interesting move, no doubt. Just as I was packing up to leave, Todd gifted me three growlers of Cape Cod Beer, and a very special, 1 out of only 200 bottles of his Bourbon Barrel Aged Strong/Old Ale. I'm saving that one to share with my husband Jon. Thank you to Cape Cod Beer Company for letting me tap into their Internet to update this blog. P.S. This great-looking, hard-working 7-barrel brewery is now for sale, and Cape Cod Beer is upgrading to a new 15-barrel system. Call Beth at the brewery for more information. Map Legend: BLUE=Oregon to Maine: RED=Return to Oregon -- EMAIL: teri@roadbrewer.com -- -- -- WEBSITE: www.terifahrendorf.com -- Click on any photo to enlarge. Email: teri @ roadbrewer.com. 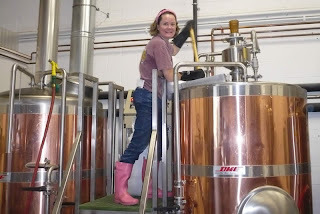 -- -- After 19 years as a professional brewer and 17 years as Brewmaster at Steelhead Brewing Company, Teri quit her job and set out on this 5-month epic quest of beer adventure. You can find my Itinerary at www.terifahrendorf.com/itinerary.htm.